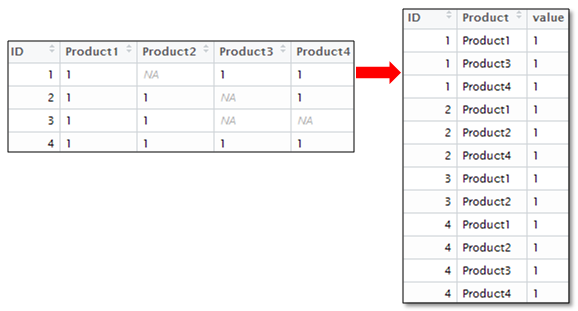 This tutorial explains how to convert data from wide to long format with R programming. Note : Before running the code below, Install reshape2 package if not installed already. The following program would create a sample data for demonstration. The following code would turn our data from wide to long format. id.vars - additional variables to keep in the output. Note : If you do not want to remove NA values, make na.rm = TRUE to na.rm = FALSE. 1 Response to "R : Convert Data from Wide to Long Format"